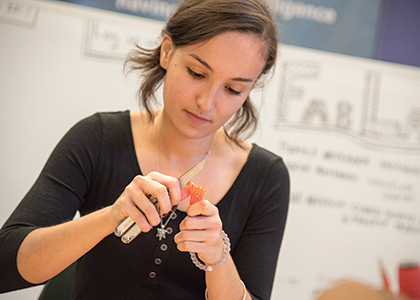 ENGINEERING | From the moment Claudia Benito Alston first peeked into the Fab Lab—a Votey Hall room full of 3D printers, laser cutters, micro-controllers, and other high-tech gizmos—she was hooked. “It had so many instruments for creating things, it just really looked cool,” says the mechanical engineering major, who graduated in December. That first look turned out to be a window on Benito Alston’s future at UVM that the then-sophomore couldn’t have imagined. Following her initial encounter, Benito Alston landed a work-study job in the Fab Lab, where she took a particular interest in exploring the capabilities of 3D printers, which create dimensional objects by building up film-thin layers of plastic, directed by a computer design program. When a design project came along that would enable her to put her 3D printer chops to work and was related to an academic area she was interested in, biomedical engineering, she jumped at the chance. The project, to develop a type of 3D printer called a “bio-printer,” which used living material rather than plastic as its basic building block, had additional appeal for Benito Alston, allowing her to connect with faculty in UVM’s top-ranked Larner College of Medicine. The particular researcher was Dr. Dan Weiss, professor of medicine and a member of the Vermont Lung Center. His project was so provocative, it approached science fiction. Weiss’s goal, in partnership with a colleague at the medical school, was to use a 3D printer to bio-print breast implants made from a living material like collagen for women who’d had mastectomies. The material would also serve as a scaffold, in future stages of the research, for stem cells that would differentiate inside the body into living breast tissue. Weiss also wanted the device to print a variety of other living materials, which could serve as scaffolding, for instance, for lung tissue in patients with lung cancer. Benito Alston was part of a student team, led by postdoctoral student Robert Pouliot, that successfully “designed and wired up” an off-the-shelf 3D printer so it would serve the new purpose. For Benito Alston, a dual citizen who grew up in an artistic household in Spain, the wonders of 3D printers and the Fab Lab extended beyond engineering to the courses she took as part of her minor in studio art. A true evangelist, Benito Alston reveled in showing her fellow art students how the Fab Lab could be used to make art—like a human skull she created with sections of corrugated cardboard cut by a laser printer, half covered with clay and half exposed, so her fellow students could behold the wonder of the Fab Lab-created architecture beneath. Ultimately, Benito Alston wants to attend graduate school and put her technical expertise to use in a biomedical engineering career, one for which UVM has given her unique preparation.